Historical Trails Through New Mexico The Land of Enchantment. An extraordinary example of Wilfred Stedman's beautifully illustrated 1940 map of the historical trails through New Mexico. The map covers New Mexico from Shiprock to el Paso. Notes the only point in the United States common to four states, where the boundaries of Utah, New Mexico, Arizona and Colorado meet. Historic routes and trails are identified, including the Butterfield Trail, the Santa Fe Trail, Goodnight Loving Trail, among others, as well as the exploratory routes taken by Cabeza de Vaca, Coronado, Onate, escalante and espejo. Steadman's map also identifies various army forts, pueblos, national and state monuments. Throughout, the map is fantastically illustrated with carriages, cowboys, soldiers, explorers, forts, wildlife, etc. The verso contains information about the various trails and the Coronado Cuarto Centennial Celebrations. 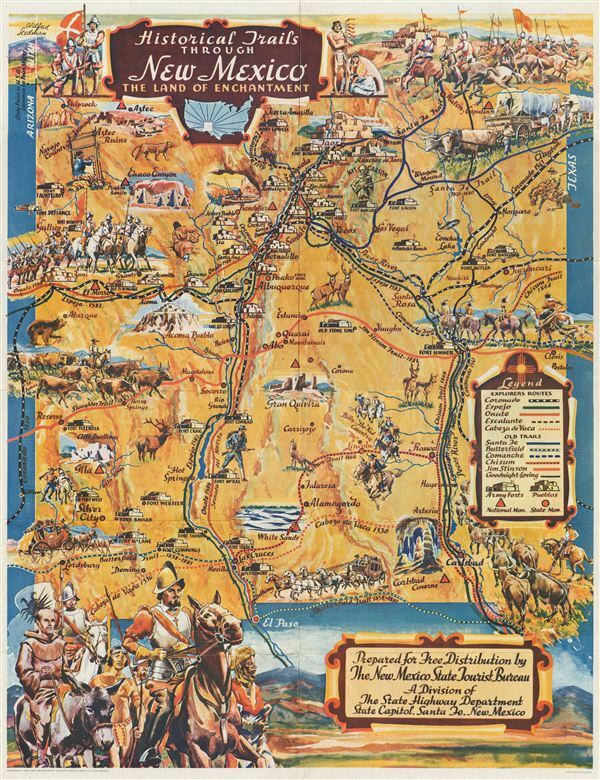 The map was prepared and illustrated by Wilfred Stedman for free distribution during the Coronado Cuarto Centennial Celebrations by the New Mexico State Tourist Bureau, a division of the State Highway Department, Santa Fe, New Mexico. This map became extremely popular and has since been widely copied – the present example is the original 1940 printing. Wilfred Stedman (1892 – 1850) was an English architect and illustrator active in Santa Fe, New Mexico in the first half of the 20th century. Born in Liverpool, Stedman later moved to New Mexico where he fell in love with the culture and natural beauty of the American southwest. Stedman's works include WPA projects and numerous collaborations with his wife, Myrtle Stedman, on such subjects as adobe houses, design, and southwestern architecture. Very good. Original fold lines visible.